China's defunct Tiangong 1 space station mostly burned up on re-entry Monday into the atmosphere over the central South Pacific, Chinese space authorities said. 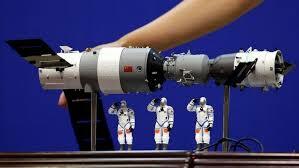 The experimental space laboratory re-entered around 8:15am, the China Manned Space Engineering Office said. Debris from satellites, space launches and the International Space Station enters the atmosphere every few months, but only one person is known to have been hit by any of it: American woman Lottie Williams, who was struck but not injured by a falling piece of a US Delta II rocket while exercising in an Oklahoma park in 1997. Most famously, America's 77-ton Skylab crashed through the atmosphere in 1979, spreading pieces of wreckage near the southwestern Australia city of Perth, which fined the US $400 for littering.